After 10 days of non-stop rain, we had a few days grace followed by even more rain, from the outer feeder bands of our first Tropical system this year. Alberto clearly didn’t know Hurricane Season doesn’t start until June 1st. I know I’m not alone in hoping that is not a sign of things to come this year. 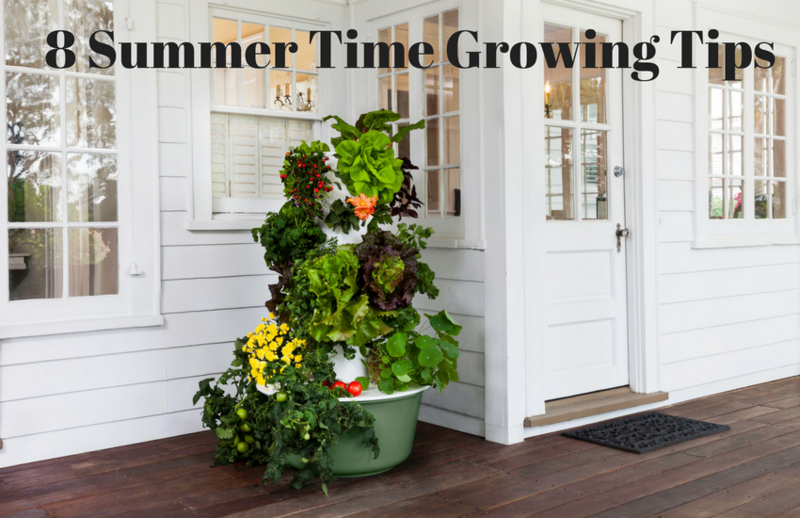 Things have really started to heat up in Florida and growing a garden in the heat can be a challenge, unless you are growing in a Tower Garden. Here are 8 things you can do to ensure you are successful through the summer. Keep the reservoir full This is probably the easiest of all. It’s simple physics. It takes longer for 20 gallons of water to heat up than it does to 5 gallons of water. Use a Dolly Have you ever walked outside on a sidewalk with no shoes on in the summer? It burns the soles of your feet in a matter of seconds. Now imagine your Tower Garden Reservoir is directly on the concrete, deck, patio etc. You get the idea. The heat from that surface now heats the water up much faster. 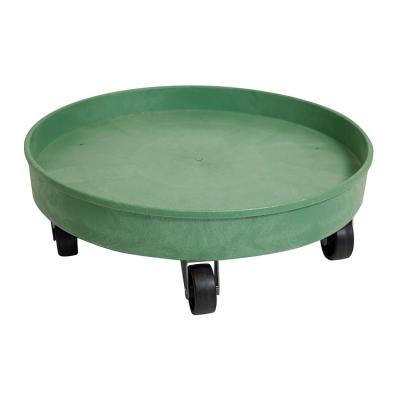 Use a Dolly or thick rubber mat under your reservoir to allow airflow. Add Tower Tonic at half or quarter strength This is probably the MOST IMPORTANT STEP OF ALL. You see, more isn’t always better, and in this case more is actually worse. A couple of things happen in the heat of the summer. First, just like us, your plants need more water because they are transpiring. It’s kind of like sweating, but for plants. Second, You are going to lose some water in the summer through evaporation. Now your water evaporates, but your minerals do not. You can see what’s happening, right? The minerals are becoming more and more concentrated in your reservoir. Not only that, but you are also going through Tower Tonic like it is going out of fashion! See, you really shouldn’t be spending more than about $90 a year on your Tower Tonic, and that includes shipping. If you are going through more than a gallon and a half a year per tower, you are adding too much. Check out this post for some detailed information on this. Put the Tower on the East side of a building Not everyone will be able to do this, but if you can your lettuces and other delicate plants will thank you for it. However, My personal Towers at home are in direct sun shortly after sunrise until sunset. Towers WILL grow in full sun. If your plants are wilting I would hazard a guess and say you were not doing number 3 above. Set your timer to run continuously during the hottest part of the day If you live where you are regularly reaching triple digits then this one is for you. Living Towers is in Central Florida. It is hot, humid and we don’t have the sea breeze cooling us down like the coastal areas do so we regularly reach mid nineties or hotter in the summer months. But get this. I have NEVER set my timer to run continuously in the afternoon on my towers at home that are in full sun all day long. There are a couple of crops that may wilt a little in the heat of the day (ie cucumbers, swiss chard) but are fine when the temperatures drop off in the evening. If everything is wilting, there is something else stressing out your plants. It could be chlorine, too many nutrients, bugs or disease. Chill the water Fill some water bottles or use frozen ice packs to chill the water if needed. Ice packs or frozen bottles are preferred over ice, as the ice will dilute the mineral solution in your reservoir. Again, you really only need to do this if you are in triple digits. Harvest Lettuce sooner rather than later. Lettuce is generally a cool weather crop and you will rarely find anyone growing it in the ground in Florida, or many other parts of the country, in the summer as it is simply too hot! Due to the way the Tower Garden works we are able to grow many crops throughout the heat of the summer we would otherwise be unable to grow. However, harvest them sooner rather than later. By this I mean harvest the lettuce as baby leaves rather than a full size head. Over time the lettuce will start to bolt and begin to taste bitter. Then, it is about getting your timing right and having another lettuce seedling ready to go into the Tower to take it’s place. Run the hot water out of the hose before filling the reservoir. We’ve all felt how hot the water inside the hose can be when we first turn the tap on. When filling your reservoir ensure you allow the water to run on the ground (or in your ground garden) until it is cold (or cool at least). I’ve just given you tips on how to keep the water cool, the last thing you want to do is put the red hot water into there. That’s it! So easy! If your temperatures are less than 100 degrees then as long as you are doing 1, 2, 3 and 8 you should be good to go! Is there you especially recommend for the Florida summer? Hi Clint. At Living Towers we grow the same crops year round, with a couple of exceptions. The only crops we do not grow in the summer are spinach and strawberries.